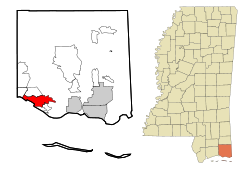 Ocean Springs is a city in Jackson County, Mississippi, USA, about 2 miles east of Biloxi. It is part of the Pascagoula, Mississippi Metropolitan Statistical Area. The population was 17,225 at the 2000 census. This page was last changed on 15 May 2018, at 12:40.